Water Tank Capacity: 20 Oz. The Serene Life Dehumidifier helps keep your home comfortable and mildew-free. This system effectively helps to remove humidity, where excess levels can result in harmful mold growth. Eliminate unwanted odors and fungus to help you breathe healthier, fresh air! The unit features a built-in ventilation fan & air filtration system for extended air flow & circulation. The included reusable filter is removable and washable for daily use -- all year long! It's perfect for moisture control in any room in the house, in the office or even large closets. The system's digital moisture control has an efficient low energy consumption rate and features LED indicator lights, so you will know when to empty the tank. Single button activation makes for hassle-free operation and super easy to use. Enjoy ultra quiet electronic moisture control without any harsh chemicals or solutions required. 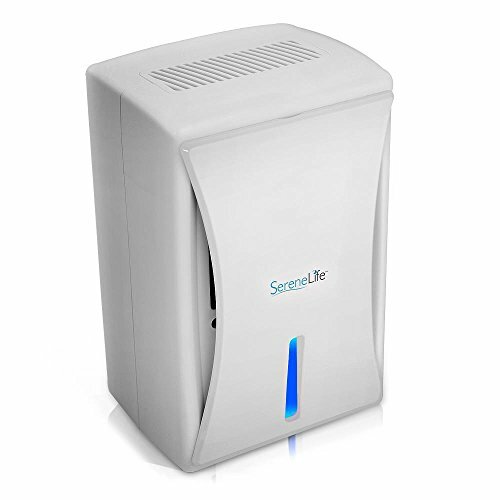 The Serene Life Dehumidifier will help you take care of your air!